Mccallum, Margaret E. and J.M. Bumsted. "John Hamilton Gray (PEI)". The Canadian Encyclopedia, 04 March 2016, Historica Canada. https://www.thecanadianencyclopedia.ca/en/article/john-hamilton-gray-1. Accessed 19 April 2019. John Hamilton Gray, premier of Prince Edward Island (1863–64), politician, military officer and administrator (born 14 June 1811 in Charlottetown, PE; died 13 August 1887 in Charlottetown). John Hamilton Gray, premier of Prince Edward Island (1863–64), politician, military officer and administrator (born 14 June 1811 in Charlottetown, PE; died 13 August 1887 in Charlottetown). John Hamilton Gray served in the British military before entering Prince Edward Island politics. A Conservative, he supported the 1860 Land Commission that many Islanders hoped would settle the Prince Edward Island land question. With the Commission’s failure, Gray looked to colonial union to solve the matter, but resigned as premier when faced with opposition to Confederation from his own party. When the Island joined Confederation in 1873, Gray served as the administrative head of the Canadian militia on the Island. He is not to be confused with John Hamilton Gray (premier of New Brunswick). John Hamilton Gray’s father, Robert Gray, came to Prince Edward Island in 1787 as private secretary to Governor Edmund Fanning. Both men came to British North America as Loyalist refugees in the wake of the American Revolution. Robert Gray married Mary Burns, daughter of George Burns, a prominent merchant and Island landlord. Gray was sent to England for his education, and spent his 20s and 30s in the British military, including service in South Africa and India. He retired with the rank of captain in the 7th Dragoon Guards. While still in the military, he married Susan Bartley Pennefather, step-daughter of J.L. Pennefather, an officer in the 7th Dragoon Guards. Gray named his first child Harriet Worrell Gray, in honour of the sister of Charles Worrell, a resident Island landlord who at one time owned close to 100,000 acres, including some once held by George Burns. The marriage of Gray’s sister, Jane, to Artemas Cambridge further strengthened Gray’s ties with leading entrepreneurs and officials who moved back and forth between Britain and Prince Edward Island. 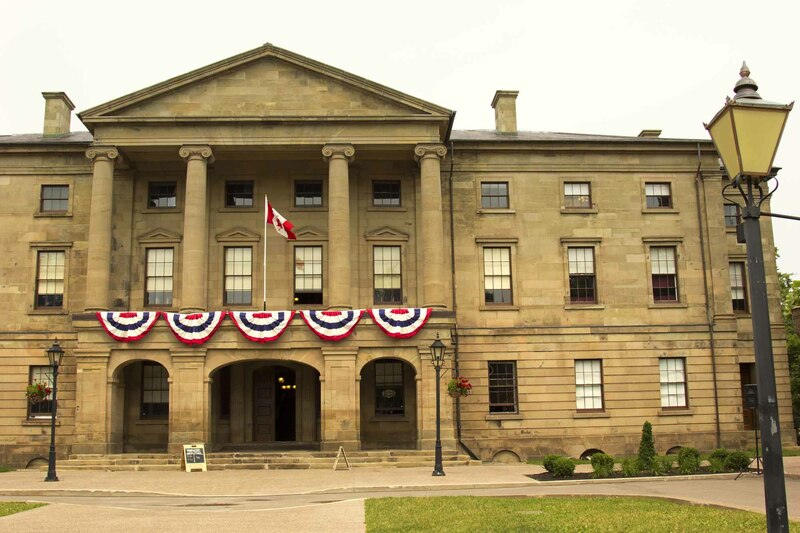 When Gray returned to Prince Edward Island in the 1850s, he was appointed to the Legislative Council, the upper house in the Island Legislature. Gray rejoined the military during the Crimean War, but did not see active service. When John Hamilton Gray returned to Prince Edward Island after the Crimean War, the “Bible Question” was a major political pre-occupation. Some Protestants wanted Bible study as part of the public school curriculum, and some Catholics disagreed. Gray, an elder of St. James (Church of Scotland) in Charlottetown, rode the controversy into the House of Assembly, winning a seat in 1858 for the Conservatives. Gray remained in the Assembly until 1864, and played a role in attempting to resolve a perennial political pre-occupation — how to wrest control of Island land from resident and absentee landlords with large holdings. Following the imperial government’s recognition of the Island’s right to responsible government in 1851, George Coles’ Reform government tried various measures to encourage holders of large estates to sell to their tenants or to the government. The Coles government succeeded in purchasing the Worrell estate, but because members of the Island elite had used their insider knowledge to effect an intermediate sale to them, the government ended up paying more for the property than Charles Worrell had asked, bringing the voluntary purchase approach into disrepute. In 1859, the newly-elected Conservative government, led by Edward Palmer, sought a new strategy that would appease popular demand for land reform without challenging the power and prerogatives of land owners. Gray proposed that the imperial government appoint an impartial Land Commission to set terms for ending landlordism on the Island. The Commission, created in 1860, proved ineffective when the imperial government refused to back legislation to compel the sale of large landholdings or to provide funds for such a buy-out. Gray, who became premier in 1863, passed compromise legislation that give tenants the right to purchase their leaseholds from landlords who agreed to be bound by the legislation. At the same time, the legislation strengthened the position of landlords by confirming their titles and ceding the Crown’s claim to land set aside as a fishery reserve. With the land question unresolved, and religious questions still inflaming political discourse, John Hamilton Gray became interested in the possibilities of colonial union as a way to obtain greater bargaining power with Britain and the United States. As premier, Gray hosted the Charlottetown Conference in September 1864, convened to discuss a union between Prince Edward Island with its Maritime neighbours, New Brunswick and Nova Scotia. Delegates from the Province of Canada changed the focus to a Confederation of all of British North America’s colonies. Gray supported the Confederation scheme at the Québec Conference in October 1864. His wife’s illness kept her home in Charlottetown, and she died two days after his return. Perhaps disheartened by his loss, and faced with opposition to Confederation from within his own party, Gray resigned as party leader and as premier at the end of 1864. In 1867, Confederation went ahead without Prince Edward Island. John Hamilton Gray attempted a return to politics in 1867, when he failed to get his party’s nomination, and again in 1873, when he failed to win his seat. Having served since 1862 as the commanding officer of the Island’s volunteers, in 1867 he accepted an appointment as adjutant general (chief administrative officer) of the Island militia, with the rank of lieutenant-colonel. When the Island joined Canada in 1873, Gray was appointed deputy adjutant general of the federal military district that comprised the Island. He retired from that position in 1881, and died at Inkerman House in 1887 following a stroke. Gray was one of two men named John Hamilton Gray who attended the Charlottetown Conference. The other was an unrelated politician from New Brunswick. In September 2014, as part of the celebration of that conference, a consortium of public and private donors unveiled a bronze statue of the two John Hamilton Grays conversing on a street corner in downtown Charlottetown. JOHN HAMILTON GRAYJohn H Gray, PEI delegate to the Charlottetown Conference of 1864, is profiled at this Canada's Digital Collections website.